Newport, RI – Newport Harbor has been the site of many firsts in its long and storied history, and this June it will be the site of another. PowerDocks, LLC a local marine development firm has partnered with the city to launch their Blue Isles™ platform in the harbor waters. Blue Isles™ is the first aquatic microgrid platform built to power and recharge electric marine propulsion vessels using solar power. Its solar panels will provide free solar generated electrical power and free Wi-Fi to vessels docked within 300 feet of the floating platform. Blue Isles™ will be moored in the public anchorage area north of the Goat Island causeway. “We are excited to showcase our new product innovation in Newport, the sailing capital of the world. Boaters visiting Newport Harbor will be the first ever to access renewable power while docked at a mooring” states Anthony Baro, Managing Partner at PowerDocks, LLC. 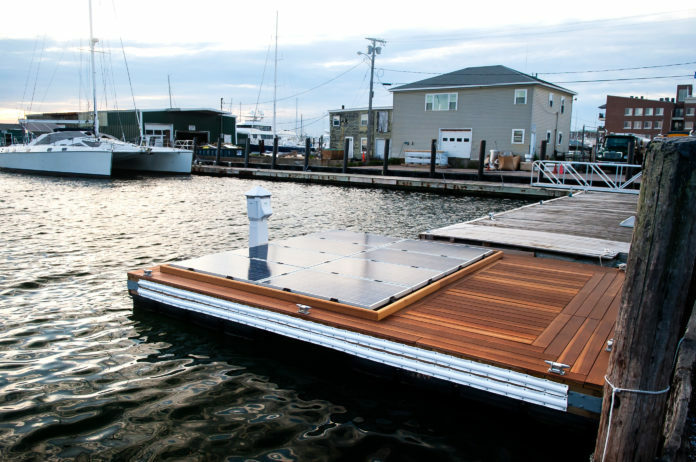 “We wanted to provide a solution for those boaters that are environmentally conscious and have embraced electric marine propulsion for their vessels” adds Chris Fagan, Managing Partner at PowerDocks, LLC.